This snow-free winter has made the grasses on our savannas very attractive. I've been waiting for a nice sunny day so I could take some pix, and today was the day. Cold, but clear and sharp. I fired up my Nikon D70 and wandered the savanna. I needed one ungloved hand to work the camera, so I moved quickly. The best views at Pleasant Valley Conservancy are of the ridge-top savannas (Units 8, 10, and 11A). 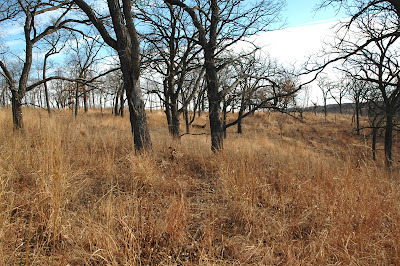 The photo here is typical, and this site can certainly be called a tallgrass savanna. The understory is mostly Indian grass (Sorghastrum nutans), with patches here and there of little bluestem (Schizachyrium scoparium). Those interested in savanna restoration should know that it has taken about 10 years to get to the state you see here. The work has been dominated by tree removal and brush control, especially buckthorn, but these savannas have been burned annually for the past 7 or 8 years, generally in the spring, although we burn in the fall when we intend to plant. And the site you see here (Unit 10, looking east from the west end of the unit), has been planted at least three times. We used a dry-mesic seed mix on the more open (prairie-like) parts and a savanna mix on the areas with less open canopy. Both mixes had Indian grass but only the dry-mesic mix had little bluestem. Most of the trees visible are bur oaks, although there are occasional white oaks and shagbark hickories. Initially there were quite a few black oaks crowding the open-grown bur oaks, and most of them were removed during the initial restoration (lots of large burn piles in those days!). Some people don't like to see this much grass, thinking that it crowds out the forbs. However, I think this is misguided. Why? A savanna is not a flower garden. From early May until late August, this savanna is dominated by forbs, and the species diversity is quite high. It is only in early September when the prairie grasses start to take over. Savannas must be burned, preferably annually, and warm-season grasses, such as seen here, make the best fuel. It's a lot easier to burn a grass-dominated savanna than an oak-leaf-dominated one. Not all savannas have this much grass. It depends mainly on the canopy cover, since these warm-season grasses are only able to compete where sunlight is plentiful. My web site has some details on how we measure canopy cover, which is about 30% for the savanna shown here. Other nearby savannas, with canopy cover around 50%, have lots less warm-season grasses. 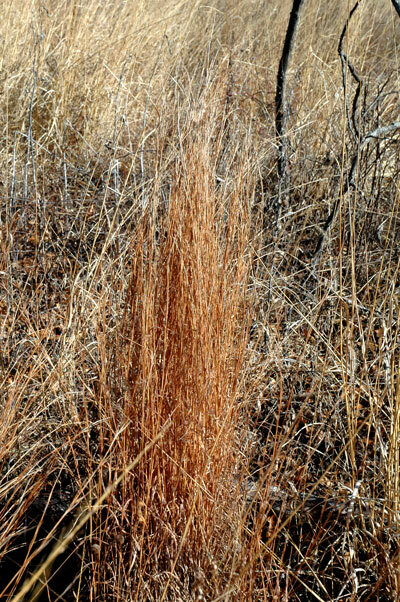 Little bluestem is more of a bunch grass than Indian grass. However, it is a very stable, long-lived grass which does extremely well in dry sites. Once established, it is hard to get rid of (who would want to?). The photo to the left shows a typical clump. Another consideration is that there is lots of year-to-year variability with these grasses, depending mainly upon rainfall. We have found that in wet years Indian grass tends to dominate whereas in dry years little bluestem takes over. We watched this succession take place in Unit 4, the nearby prairie remnant. When we first restored this prairie in 1998 (mainly by burning) Indian grass flourished. However, during the dry years of the mid 2000s, most of the Indian grass disappeared and the site was dominated by little bluestem. But since 2008 we have been in a wet cycle again and Indian grass is back in force. With global warming in the offing, who knows what changes might occur?